Design Rules for Biomolecular Adhesion: Lessons from Force Measurements. Deborah Leckband, Annu. Rev. Chem. Biomol. Eng. 1 (2010) 365-389. Intermolecular forces in biology. D. Leckband, J. Israelachvili. Quart. Revs. Biophys. 34 (2) (2001) 105-267. Direct Measurement of a Tethered Ligand-Receptor Interaction Potential. J. Y. Wong et al., Science 275 (1997) 820–822. Direct measurements of multiple adhesive alignments and unbinding trajectories between cadherin extracellular domains. Sivasankar, S., B. Gumbiner, and D. Leckband, Biophysical Journal 80 (2001) 1758-1768. Thin film morphology and tribology of food emulsions: a study of three mayonnaise samples. S. Giasson, J. Israelachvili, H. Yoshizawa, J. Food Science 62 N4 (1997) 640-652. Impact of polymer tether length on multiple ligand-receptor bond formation. Claus Jeppesen, Joyce Y. Wong, Tonya L. Kuhl, Jacob N. Israelachvili, Nasreen Mullah, Samuel Zalipsky, Carlos M. Marques. Science 293 (2001) 465-468. 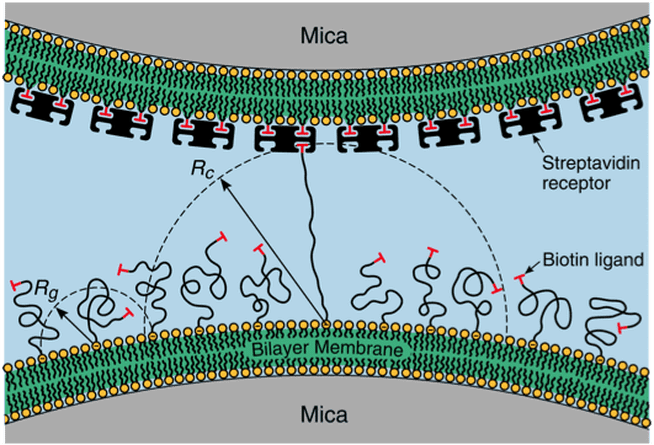 Interaction forces and adhesion of supported myelin lipid bilayers modulated by myelin basic protein. Younjin Min, Kai Kristiansen, Joan M. Boggs, Cynthia Husted, Joseph A. Zasadzinski, Jacob Israelachvili. PNAS 106 (2009) 3154-3159. Frictional-adhesion of Patterned Surfaces and Implications for Gecko and Biomimetic Systems. Zeng, Hongbo; Pesika, Noshir; Tian, Yu; Zhao, Boxin; Chen, Yunfei; Tirrell, Matthew; Turner, Kimberly; Israelachvili, Jacob, Langmuir 25 (13) (2009) 7486-7495. Protein- and metal-dependent interactions of a prominent protein in mussel adhesive plaques. Dong Soo Hwang, Hongbo Zeng, Admir Masic, Matthew J. Harrington, Jacob N. Israelachvili and J. Herbert Waite. J. Biological Chem. 285 (33) (2010) 25850. General hydrophobic interaction potential for surfactant/lipid bilayers from direct force measurements between light-modulated bilayers. Stephen H. Donaldson, Jr., C. Ted Lee, Jr., Bradley F. Chmelka, and Jacob N. Israelachvili PNAS (2011) 108 (38) 15699-15704. Dynamics of force generation by confined actin filaments. Xavier Banquy, G. Wren Greene, Bruno Zappone, Anatoly B. Kolomeisky and Jacob N. Israelachvili, Soft Matter (2013) 9 2389-2392. Stick-slip friction and wear of articular joints. Dong Woog Lee, Xavier Banquy, and Jacob N. Israelachvili, PNAS (2013) 110 (7) E567-E574. Surface Forces Apparatus and its applications for nanomechanics of underwater adhesives. Dongyeop Xris Oh, Sara Shin, Hee Young Yoo, Chanoong Lim, Dong Soo Hwang, Korean J. Chem. Eng., (2014), 13, 1306-1315. Developing a general interaction potential for hydrophobic and hydrophilic interactions. Stephen H. Donaldson Jr., Anja Røyne, Kai Kristiansen, Michael V. Rapp, Saurabh Das, Matthew A. Gebbie, Dong Woog Lee, Philipp Stock, Markus Valtiner, and Jacob Israelachvili, Langmuir (2015) 31 (7) 2051-64.